Sound Archivist Sarah-Joy Maddeaux shares snippets from just a few of the hundreds of oral history interviews with women held in the Essex Sound and Video Archive. Women’s history is one of the areas where oral history can make a great contribution. From telling the stories of notable women who have made a significant impact in their field, to telling the equally significant stories of ‘everyday’ women who made an impact just by their daily routine, first-hand accounts can reveal subject areas that do not always make it into written records. Furthermore, they can reveal the ‘whys’ of history – motivations that prompted women to take the actions they did. The Essex Sound and Video Archive at the Essex Record Office is one resource for accessing such sources for women’s history. A substantial number of the oral history interviews in our recollection were recorded with women – and many were recorded by women (a discussion topic for another time – what difference does the gender of the interviewer make to the recording?). Let’s start with some headliners. We have an interview with Elfrida Johns, who worked at Bletchley Park during the Second World War (Acc. SA580). Eva Hart, a Titanic survivor, recorded her memories on a number of occasions which have made it into the Archive (Acc. SA318, Acc. SA398, SA 1/323/1, and SA 19/1/14/1). Helen Welburn was the first female Superintendent of the Essex Police, on her appointment in 1970, and spoke about the major improvements she made for other women in the police force (SA 25/1/10/1). We even have the reminiscences of a Suffragette, Helena Taylor, from an edition of the Sounds of Brentwood talking magazine (SA 2/1/12/1). We feel privileged to have the reminiscences of such accomplished women in our archives. But we also feel privileged to have the reminiscences of so many other Essex women in our archives. Perhaps their lives did not figure in newspaper headlines; perhaps they were never known outside their village; perhaps they did not feel they had a story worth telling. However, it does not take long to get hooked into each woman’s story, no matter how mundane it seems at first, as her life unfolds over the course of the interview. Take, for example, the many ‘New-Towners’ who have been recorded for posterity. At a young age, these women left their families and homes in East London to settle in relatively rural locations and establish their own homes, away from familial support networks. Dr Judy Attfield’s collection of interviews with Harlow residents is particularly rich in women’s accounts, fully exploring their experiences and emotions on moving to these remote locations (SA 22). For example, Mrs Summers in 1986 described her feelings when she and her husband moved to Harlow New Town in 1952 (SA 22/1364/1). We have recently received the recollections of women who moved even further to forge new lives for themselves. The Evewright Arts Foundation recorded a number of Windrush generation immigrants about their experiences of moving to Britain. Some already had family here; some left their family behind until they had established a new home for their children. Most commented on the cold; most admitted to encountering racist attitudes. But they persevered until, like Carol Sydney, they could claim to have made a success of their lives in Britain (SA 69/1/5/1). Life could also be a struggle for those who stayed in the same place. One of our favourites is Edie Brown, who was born in Kelvedon in 1895 and spent most of her life in Witham. She worked hard from the day she left school in her teens: working in domestic service and local industry before her marriage, then contributing to the household economy by going pea-picking or fruit-picking, sometimes before her children woke, or sometimes taking them with her. But she was never subservient: she would rather lose a job than put up with wrongful accusations or excessive demands in service (SA 59/1/7/1). In the same collection, Elsie Hammond recalls female workers at Pinkham’s glove factory striking for more pay (SA 59/1/16/1). Sometimes it is precisely the ‘normal’, everyday nature of an interviewee’s life that is useful to the researcher. Where else could you find detailed descriptions of household chores explained by the women who did them? Memories of helping mothers with household work allow us to reach back into the nineteenth century for the methods of housekeeping common in Essex. As technological advancements reduce domestic chores to button-pressing, without these interviews the former way of life of women kept busy full-time cooking and cleaning would otherwise be lost. With cultural change, it is also important to preserve the stories of mothers struggling to run their households on the limited budget provided by their husbands, as Connie Robinson shared about women she knew (SA 26/61/1). Oral history interviews even give us the chance to look back on areas of private life that were formerly taboo. In later life, women were often happy to speak about their experiences of puberty or childbirth that they would not have discussed at the time. But. There is still much about women’s experiences that is lacking in the historical record. We were intrigued by the Rebellious Sounds Archive, which captured the stories of activist women in south-west England. What more can you do to preserve the significant contributions of the women you know? Please do get in touch if you want to discuss an idea for an oral history project. Many of these topics and more will be discussed at the Essex Women’s History Festival at the University of Essex tomorrow, part of the Snapping the Stiletto project. 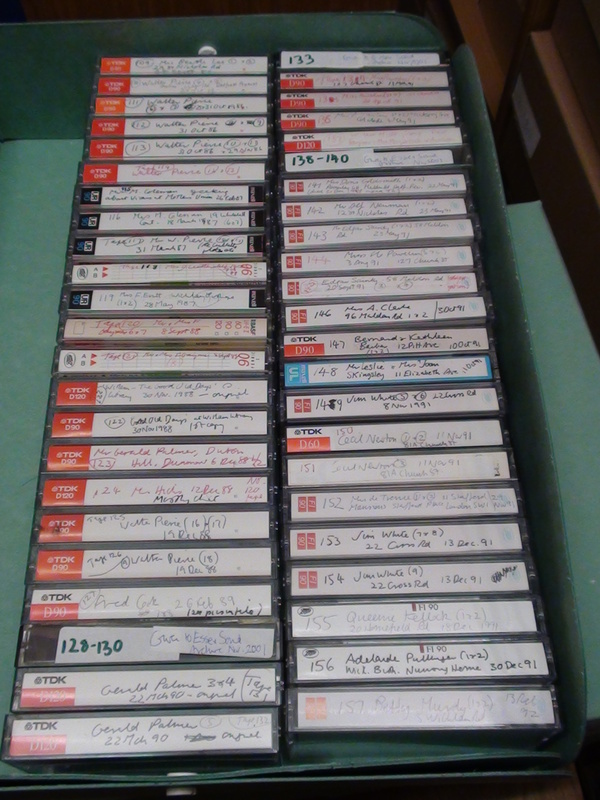 You will also have an opportunity to listen to these and other recordings of women from the Essex Sound and Video Archive, and to chat to Sound Archivist Sarah-Joy Maddeaux about our collections. There are still a few (free!) tickets, so book now! If you cannot make it to the Festival, some of these recordings can be played online from the comfort of your own home. Look up the reference numbers on Essex Archives Online to check. Some will have a play feature; some will allow you to order the material to listen in the Playback Room at the Essex Record Office; and others will advise you to contact us to arrange to hear the material. 6 February 2018 marks 100 years since some UK women were granted the right to vote in parliamentary elections, after decades of campaigning. The Representation of the People Act 1918 gave the right to vote to women over 30 who met a property qualification – 8.4 million women in total. With so many men having been killed in the First World War, there was a fear that if equal voting rights were given female votes would outnumber male voters, and the country would end up with a ‘petticoat parliament’. The campaign for votes for women had stretched over decades, and for most of that time made little progress. In this blog post we take a look at some of the local women and men who took part in this momentous national campaign. Lilian Hicks (née Smith) was born in Colchester in 1853. She married Charles Hicks, and they made their family home at Great Holland Hall near Frinton-on-Sea. From the 1880s, when she was the mother of young children, Lilian worked for the women’s suffrage movement, organising meetings across East Anglia, and when she was older her daughter Amy joined Lilian in her campaigning. They belonged to various suffrage organisations over the years, joining the militant WSPU in 1906 before breaking away with the more peaceful Women’s Freedom League (WFL) in 1907, then ultimately rejoining the WSPU. Mother and daughter were arrested together on 18 November 1910 at the protest which became known as Black Friday, a struggle between campaigners and police in Parliament Square which turned violent. Amy took part in the WSPU window smashing campaign in March 1912, and was arrested and sentenced to four months hard labour. She spent time in Holloway and Aylesbury prisons, including time in solitary confinement. She was one of the suffrage prisoners who went on hunger strike, and was subjected to the brutal procedure of forcible feeding. Sisters Dorothea and Madeline Rock of Ingatestone both spent time in prison for their campaigning activities. They were daughters of Edward Rock, an East India tea merchant, and his wife Isabella. Dorothea was born in 1881 and Madeline in 1884, and they had a middle-class upbringing, with a governess, a cook, and a housemaid employed in the household. Sisters Kate (b.1874) and Louise Lilley (b.1883) were daughters of Clacton magistrate and company director, Thomas Lilley JP. They were also both members and officials of the Clacton branch of the WSPU. Like the Rock sisters and Amy Hicks, they took part in the March 1912 WPSU window smashing campaign and were sentenced to two months’ hard labour as a result. They were released in early May, and returning home to Clacton they were ‘met with a most hearty welcome home from hundreds of spectators, including many women wearing the W.S.P.U. badge’ (Clacton Graphic, 4 May 1912). The crowd cheered the sisters, and they were presented with bouquets. The Graphic further reported that ‘Their suffering for the cause, which they believe to be right and just, have not damped their ardour, and they are more determined than ever to go forward’. the horrors of it are still too fresh in my memory for me to feel able to dwell in any way on the details. Eliza Vaughan was born in Brixton in 1863. Her father was a vicar, and later moved the family to Finchingfield when he became vicar there. From 1895 Eliza lived in Rayne near Braintree, and researched and wrote about the local area. Eliza was an active member of the National Union for Women’s Suffrage Societies (NUWSS) for many years. Unlike the WSPU, the NUWSS believed firmly in sticking to peaceful campaigning activities. Eliza was one of the leaders of the Essex contingent, beginning in Colchester and marching through through several town and villages including Mark’s Tey, Coggeshall, Braintree, Witham, Kelvedon, Chelmsford and Romford. The marchers included both men and women, and in each place they stopped they made speeches, distributed leaflets and had conversations with people about women’s suffrage. Throughout the march they took pains to distance themselves from the militant actions of the Women’s Social and Political Union (WSPU) led by Emmeline Pankhurst. The audiences at the meetings are described by Eliza as being mostly orderly, but the marchers were in places subjected to abuse and egg-throwing. In an account of the march titled ‘Humours of the Road’ (T/Z 11/27) Eliza describes the march as a pilgrimage ‘journeying to a shrine, dedicated to Justice and Right’. Rosina Sky led the charge for votes for women in Southend. She was born in Whitechapel in 1877, the daughter of a Russian tobacconist and pipe manufacturer. She married William Sky, and they had three children together, before divorcing. As a single mother of three, Rosina ran a tobacconists shop of her own in Southend at 28 Clifftown Road. As a woman in a man’s world, Rosina had all the responsibilities of running a business with none of the rights accorded to men in the same position. She was treasurer of the Southend branch of the Women’s Social and Political Union (WSPU), and a member of the Tax Resistance League, whose slogan was ‘No Vote, No Tax’. Their key argument was that it was unjust for women to pay tax when without a vote they had no say in how it might be spent. In September 1911, bailiffs seized goods belonging to Rosina in lieu of the taxes she had refused to pay. The goods were publicly auctioned, accompanied by a parade of the WSPU in Southend to protest. Further goods were confiscated from Rosina and sold in June 1912. She continued to run her shop until her death in 1922. A small display of records relating to Essex suffrage campaigners from the ERO’s collections is currently on display in our Searchroom, until the end of April 2018. One of the advantages of working in the Searchroom is that you often find interesting items from our collections passing through your hands. One document which caught our eye recently is this ‘Certificate of Acknowledgement of Deeds by Married Women’, something which we have only a few examples of (D/DC 27/680/A). 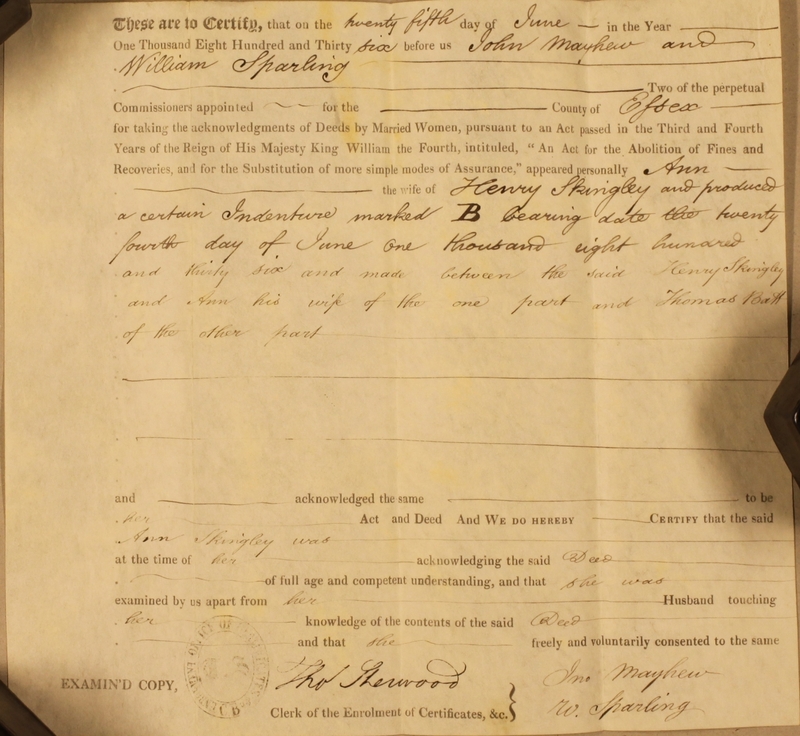 These certificates, the earliest dating to 1833, are sometimes found attached to the deed to which they refer. They were created in a half attempt to right the centuries old wrong whereby on marriage all the property belonging to the wife became the property of the husband, meaning she effectively lost all control over its disposition or sale. Despite a common law requirement that she be a party to the deed of sale, it was generally held that the husband’s will always prevailed and abuses of that position were thought to be common. In 1833 a clause in the Fines and Recoveries Act required that a woman selling property jointly with her husband would have to be interviewed separately by a public official, known as a commissioner, to certify that she was ‘of full age and competent understanding’, to confirm that she was not being forced into agreeing to the sale. The example above relates to the mortgaging of a property by Mr Henry Skingley and his wife Ann to one Thomas Batt. It was also noted on the original deed (D/DC 27/680) that this examination had taken place. The Married Women’s Property Act of 1882 finally granted equal rights in property ownership to married women and simultaneously brought to an end the production of the certificates of Acknowledgement. We have a small number of original certificates amidst our vast collection of deeds and lists of the commissioners for Essexcan be found in Q/RDm 3.